Tear up the trails on the awesome Moto Cross Bike! This tough-as-dirt LEGO Technic 2-wheeler has lots of authentic features, like chain- drive, working pistons, front and rear suspension and knobby tires. This cool 2-in-1 model is just like the real thing! Rebuilds into a racing Speedway Motorbike with front suspension, rear suspension and engine with moving pistons…. Tear up the trails on the awesome Moto Cross Bike. This tough-as-dirt LEGO Technic 2-wheeler has lots of authentic features, like chain-drive, working pistons, front and rear suspension and knobby tires. This cool 2-in-1 model is just like the real thing. Rebuild into a racing Speedway Motorbike with front suspension, rear suspension and engine with moving pistons. 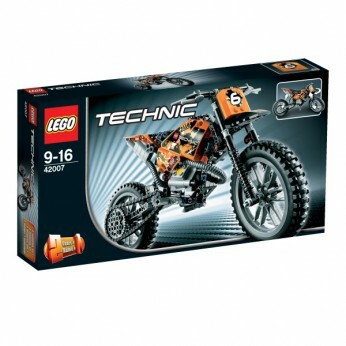 This toy costs approximately £24.99 (for the latest and best prices make sure you check our retailer list for the LEGO Technic Moto Cross Bike 42007 above). In our review of LEGO Technic Moto Cross Bike 42007 we classed it as being suitable for ages 6 years, 7 years, 8 years, 9 years, over 10 years but recommend you check the manufacturer specific advice before purchasing.